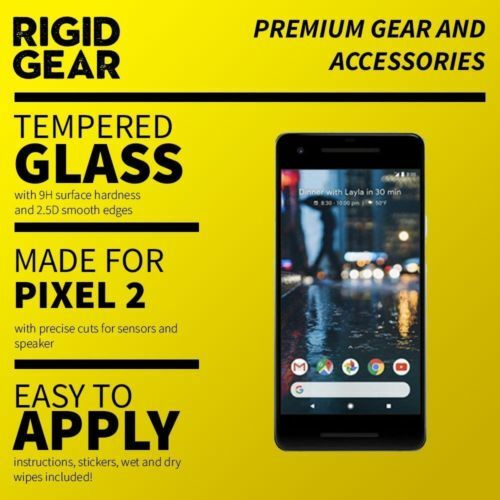 Offering the best protection for your phone, the Rigid Gear Tempered Glass Screen Protector has been specially made for your Pixel 2, with precise cuts for proximity sensors, speaker and camera, which means 95% of your phone's screen will be protected. With a surface hardness of up to 9H, this special tempered glass, has been made to be durable, and in an unlikely event of dropping your phone, this screen protector will absorb all the impact, protecting your precious display. To offer you the best experience possible, the Rigid Gear Tempered Glass Screen Protector, has smooth and curved edges, which will perfectly blend wiht your phone. Please keep in mind that only 95% of your phone's screen will be covered by our screen protector. Due to Pixel 2's curved margins, the screen protector will have a small gap at each margin, but it will still protect 95% of your phone's display, and the best thing, it is compatible with all the cases available on the market.